Two-time defending Turkish Airlines Euroleague champion Olympiacos Piraeus improved to 7-6 in Top 16 Group E by downing Anadolu Efes Istanbul 78-83 on the road on Friday. Olympiacos had already qualified to the playoffs before the game, but faces a battle for third place in Group E against archrivals Panathinaikos Athens at home next week. 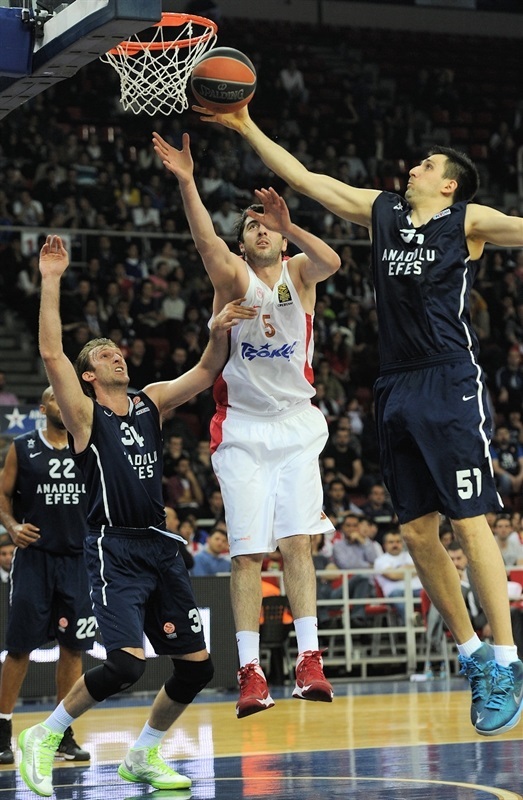 Efes dropped to 2-11 with its eighth consecutive loss. 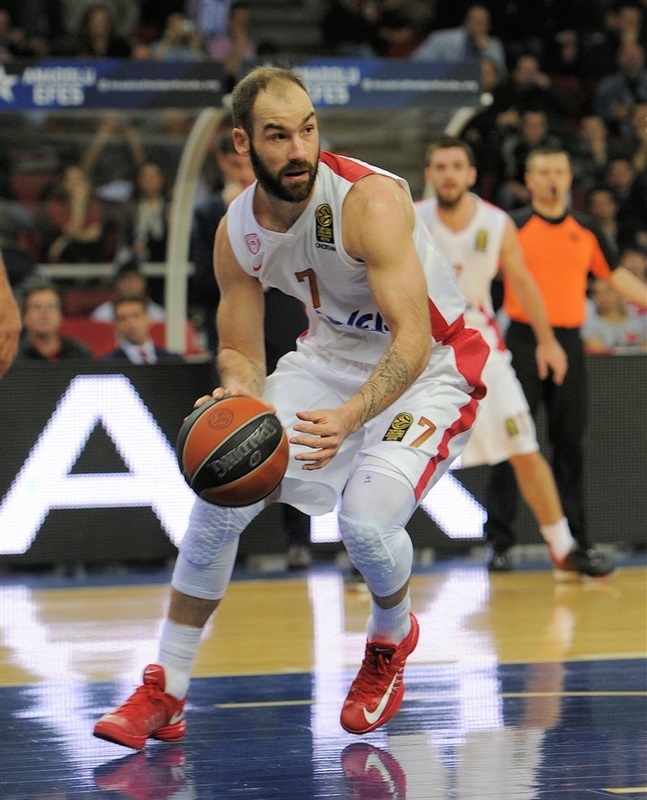 Euroleague MVP Vassilis Spanoulis led the winners with 17 points. 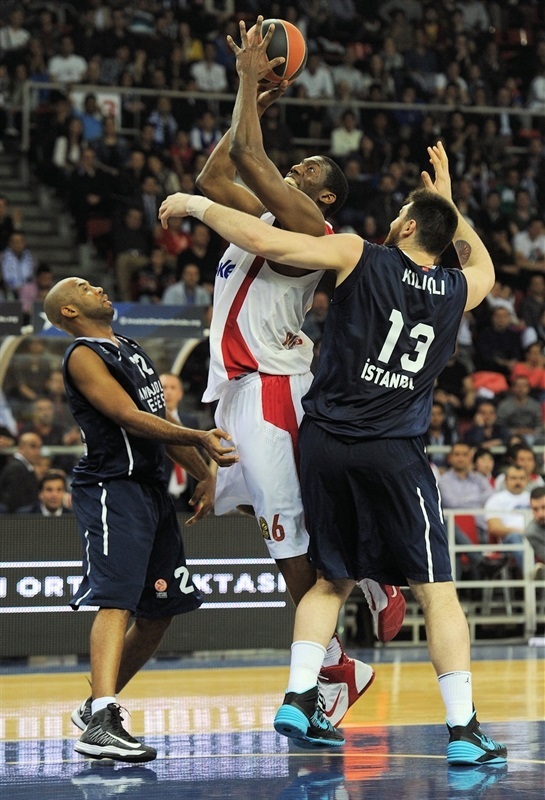 Bryant Dunston and Matt Lojeski each added 13, while Giorgi Shermadini had 10 for Olympiacos. Kostas Vasileiadis and Jamon Gordon each scored 16 points for Efes and Milko Bjelica added 14. Olympiacos had a strong start and a dunk by Dunston gave the Reds a 5-11 lead. 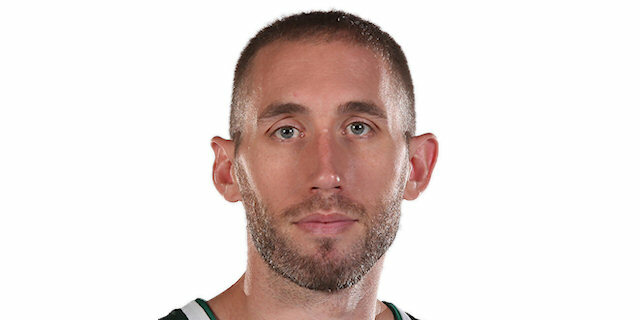 Zoran Planinic, who left the game at halftime, stepped up for Efes and a jumper by Gordon gave the hosts a 16-15 lead late in the first quarter. Kostas Sloukas and Brent Petway combined for all the points in a 0-8 run that put Olympiacos ahead for good, 18-25. Lojeski and Spanoulis led Olympiacos to a double-digit margin, 32-43, at halftime. Kerem Gonlum and Batuk tried to change things for Efes, but an outstanding Spanoulis kept Olympiacos way ahead, 60-67, at the end of the third quarter. Olympiacos boosted its margin to 70-81 midway through the fourth quarter and cruised to a well-deserved road win. Ioannis Papapetrou got Olympiacos going with a driving basket and soon added a corner three-pointer for a 0-5 lead. Kostas Vasileiadis answered from downtown, but Giorgi Shermadini scored down low and soon added a dunk off a great pass by Spanoulis to boost the Reds' lead to 3-9. Milko Bjelica downed a mid-range jumper, but a steal by Vangelis Mantzaris allowed Bryant Dunston to shine with a fast break slam. Vasileiadis ignited the crowd with a wide-open three-pointer in transition. Spanoulis scored in penetration only to see Zoran Planinic do better with a rainbow triple from the top of the key that made it 11-13. Dunston scored down low and Planinic buried his second three-pointer, as Olympiacos tried a more athletic lineup with Matt Lojeski and Brent Petway on court. A close jumper by Jamon Gordon gave Efes its first lead, 16-15. Lojeski made free throws before Gordon scored again. 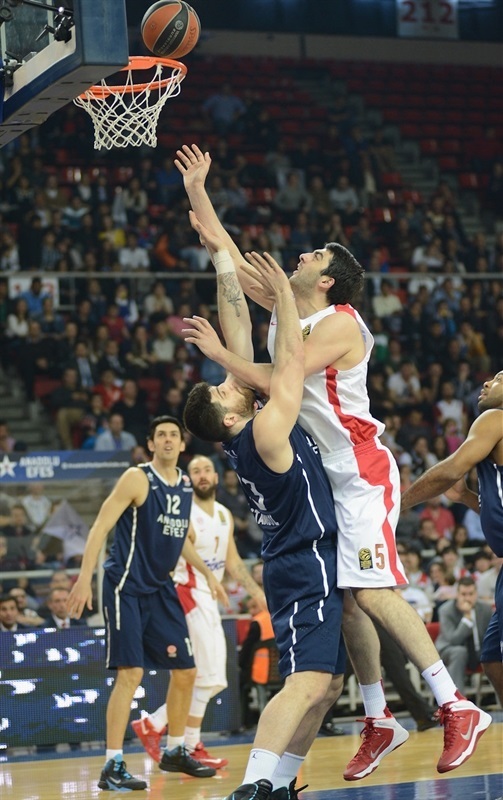 A buzzer-beating jumper by Kostas Sloukas restored a 18-19 Olympiacos lead after 10 minutes. Sloukas struck from downtown early in the second quarter and Petway also sank one from beyond the arc to boost Olympiacos's lead to 7. Efes struggled to find the way to the basket against the Reds' physical defense; the hosts were held scoreless for almost three minutes until Planinic shined with a reverse layup. Lojeski scored around the basket, but Bjelica improved that with a three-pointer. Shermadini and Gordon traded baskets and a free throw by Dusko Savanovic made it 26-29. Lojeski beat the shot clock buzzer with a bomb from downtown and a coast-to-coast layup by Mardy Collins boosted Olympiacos's lead to 8. Spanoulis hit a fade-away jumper, which Birkan Batuk erased with a fast break layup. After Dunston split free throws, Vasileios Kavvadas and Gordon exchanged baskets. Then Spanoulis put his team ahead by double figures. Gordon nailed a jumper, but a driving layup by Spanoulis fixed the halftime score at 32-43. 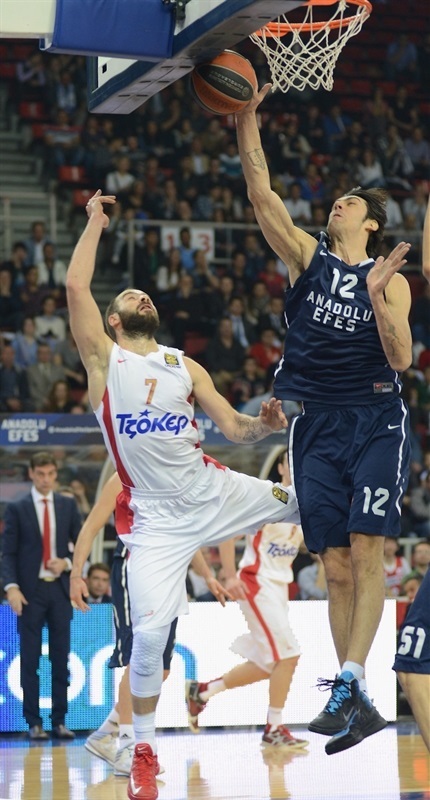 Bjelica made free throws immediately after the break and soon added a three-pointer to give Efes fans hope at 37-43. Petway quickly answered from downtown and a jump hook by Kerem Gonlum kept the hosts within 39-46. Shermadini made free throws, but Bjelica shined with a driving layup and a fast break basket by Gonlum caused the Reds to call timeout at 43-48. Dunston scored down low, however Batuk hit a three-pointer and a layup by Gordon brought the hosts even closer, 48-50. Lojeski rescued Olympiacos with a layup-plus-foul and Cedric Simmons soon gave his team some fresh air at 48-55. Cedi Osman responded with a corner triple. Dunston made free throws, but a layup by Deniz Kilicli made it a four-point game. Spanoulis beat the shot clock with a huge three-pointer and a dunk by Dunston caused Efes stopped the game at 53-62. Vasileiadis hit a three-pointer and erased Simmons's free throws with a floater, but another triple by Spanoulis restored a 58-67 Olympiacos lead. 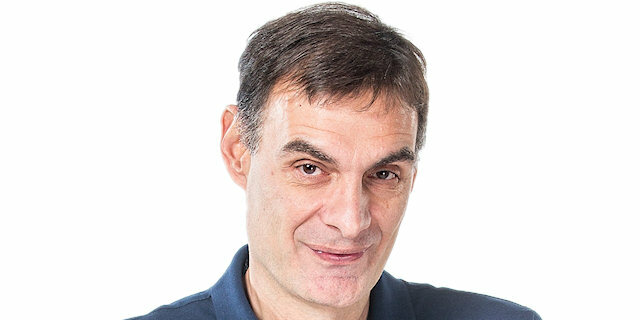 A close basket by Gordon brought Efes within 60-67. Simmons shined with a power layup early in the fourth quarter. Savanovic made free throws, but Mardy Collins hit a stop-and-pop jumper and Lojeski beat the shot clock buzzer with a three-pointer, which broke the game open at 62-74. Gonlum made 3-of-4 free throws and a running triple by Vasileiadis got the crowd involved at 68-74. Spanoulis immediately answered from downtown, but Bjelica hit a baseline jumper. A one-handed dunk by Dunston and a jumper by Sloukas restored a double-digit Olympiacos lead, 70-81. Vasileiadis tried to change things with a jumper. Shermadini and Batuk traded free throws and Osman got Efes a bit closer, 74-82, with three minutes left. Batuk took over with a fast break layup, but a free throw by Shermadini sealed the outcome, 76-83, with under 2 minutes left. Efes kept trying, but Olympiacos ran the game clock down and added a quality road win. "Today was a special game because we knew from yesterday that we qualified. Sure we wanted to win, but we did not give 100% we could give. In the end, what we wanted was to win the game and we did. Good luck to Coach Angel and Anadolu Efes. We have before us a particular game with Panathinaikos, we must prepare our minds and our bodies for this game." "We wanted to keep our confidence high . We can play better, but what matters is that we got the win. We faced problems in defense, but in attack we were productive."